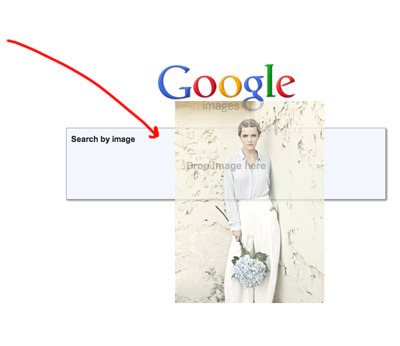 Did you know you can do a REVERSE Google Image search? But. It's much easier to find great images on the internet than it is to figure out who shot them. And when you click through you just hit the home page of a blog or (worse) a Tumblr page where THE PHOTOGRAPHER ISN'T CREDITED. Drag the image straight off Pinterest or Tumblr or wherever you found it and drop it into Google Images. Not only did I find the name of the photographer and the original source, I found a bunch more images from the same shoot. and choosing the "Upload an image" feature. Will someone test this out for me? I've done the reverse image search on google the second way you show, and it usually works. I've also used TinEye with great success. The drag and drop thing also works. Thanks for posting about that! it's SO MUCH FASTER. I used to use TinEye, but I got "0 Results" SO OFTEN. Google is just better at crawling the web. I can drag and drop on my PC, just tried it. 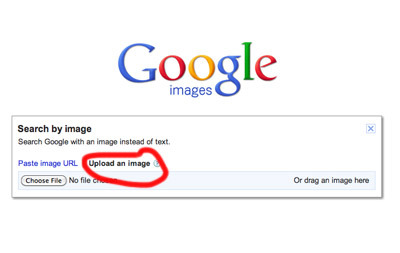 On a PC you can just copy and paste the image's URL into Google. 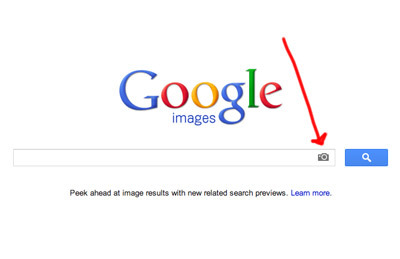 Google will ask if you want to "search by image" and you click on the link for that. Voila! I tried that with a Pinterest URL, and I got this message: "The URL doesn't refer to an image, or the image is not publicly accessible." Oh, OK. I've never tried it with a Pinterest URL. For an image on Pinterest I usually try to click over to the "source." I will have to try this drag an drop method. Won't work for a Pinterest URL -- you need the URL of the actual image (ends in .jpg or whatever). Just right click on the image and "Copy Image URL" (Mac, Chrome) or something similar. What Jen said. That's what I do. Tis awesome. This is the exact reason why I can't stand Pinterest (although I'm guilty of having one). I'm tired of searching repin after repin for an image source. I love doing this - it's transformed my use of pinterest over the past few months - if I notice someone's not credited a pin (or just linked back to a tumblr) I'll find the original source and pin directly from there. Sometimes when I reverse google images though, I just enter some endless wormhole of tumblrs ... why do angsty teen bloggers rejoice in breaking the chain?! Yeah, I've done this for a long time. I wish, though, that when Google returned the results, they could show you which was the oldest result (or gave some other indication of which was the ORIGINAL). Like Meredith said, sometimes it's still a giant wormhole. It works really well for fashion / obviously editorial images like the example ESB used. i love this feature. unfortunately i often attempt to use it for plant identification, where it is, to say the least, less successful. I like when you reveal what a nerd you are. Usually I don't understand what you're talking about but this actually made sense. And was useful. Tried it on a link from pinterest, and yeah, it doesn't work that way, but, you can always click on the pinterest image which will take you to the site it was pinned from and start the reverse search from there. Did one off my own blog, it identified my blog as the original source, but my original source was a photographer with a facebook page (i'm guessing google can't search through facebook images for the same reason pinterest can't pin them). Luckily for him, I credited him. 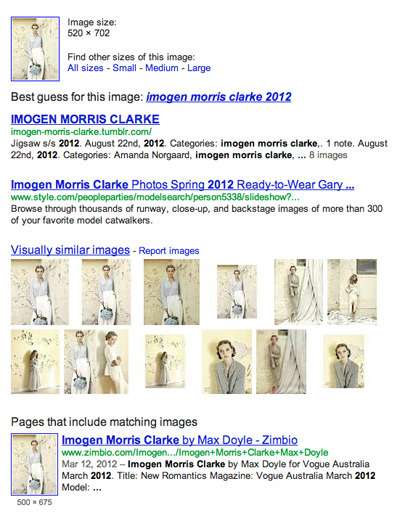 Also, took an image off my computer archives, it correctly identified the source, a major online fashion magazine. super duper cool! thanks for the tip! There is a website called TinEye that is a reverse image search as well. Sometimes it works, sometimes it doesn't. The hardest part is weeding through tumblrs until you find the original source! This is so great! I find it so frustrating when the only image source I can get is Tumblr. It's so important to credit others with work and unfortunately in a lot of ways tumblr prevents that. I will definitely be using this. i might get in trouble for this, but. if you see an uncredited image on a tumblr or pinterest or whatever, and you have to go searching for the source. do you have to even credit where you originally saw it at that point? AND where the person you saw it from saw it? It's good karma. 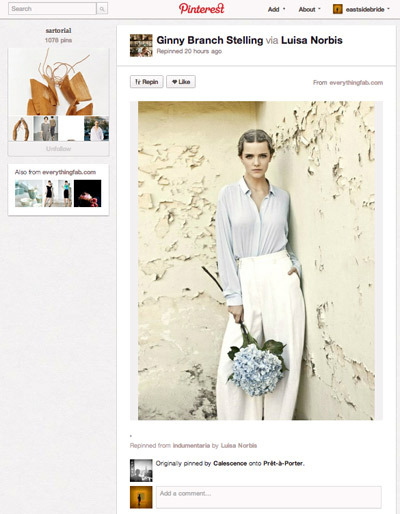 Your readers might like that Tumblr or Pinterest board. And: It helps your Google ranking to link to outside sources.